Salon Invi has become one of the most well-known and highly respected ultra-modern, upscale hair salon in the entire Boston area. As a testament to this, the team’s dedication and passion has once again earned them one of the area’s most coveted awards – Northshore Magazine’s 2019 Editor’s Choice Award for Wedding Hair. Northshore magazine has a 15-year history of providing those living in and visiting the North Shore area with outstanding recommendations for food, activities, and services. Its annual Best of the North Shore (BONS) Wedding Awards focuses on several unique categories designed to help brides-to-be plan the perfect wedding. These categories include businesses that provide attire, beauty services, wedding details, catering and food, venues and settings, and even wedding planning services. Salon Invi’s award is in the Beauty category, which is further broken down into hair, makeup, day spas, personal trainers, and spa services. Salon Invi has been the recipient of the Editor’s Choice Award for Wedding Hair every year since 2011, which serves as a testament to the team’s vision to help brides look and feel amazing on their wedding day. Salon Invi focuses on helping men and women alike define themselves with style, sophistication, and personal inspiration. The team of stylists views hair design as a form of art that helps their guests represent themselves to the world. Whether you have lived in the Boston area for your entire life, you have recently relocated, or you’re simply visiting, Northshore magazine is an excellent resource to help you enjoy the finer things the area has to offer. Aside from its annual Wedding Awards, the magazine provides reviews of restaurants, spas, and more – all designed to help men and women make the best possible decisions for their unique wants and needs. The magazine focuses on categories including food and drink, shopping, arts and culture, various places, events, and various businesses to help Boston-area residents and visitors better explore their surroundings. Those interested in subscribing or renewing their subscriptions to Northshore or its quarterly magazine, Northshore Home, can visit the website to learn more. While the former focuses on area lifestyle, events, and businesses, the latter is all about interior design, real estate, landscaping, organization, and more. Both magazines serve as excellent inspiration, and you can purchase them as a print or digital subscription. Individual back issues are available, as well. 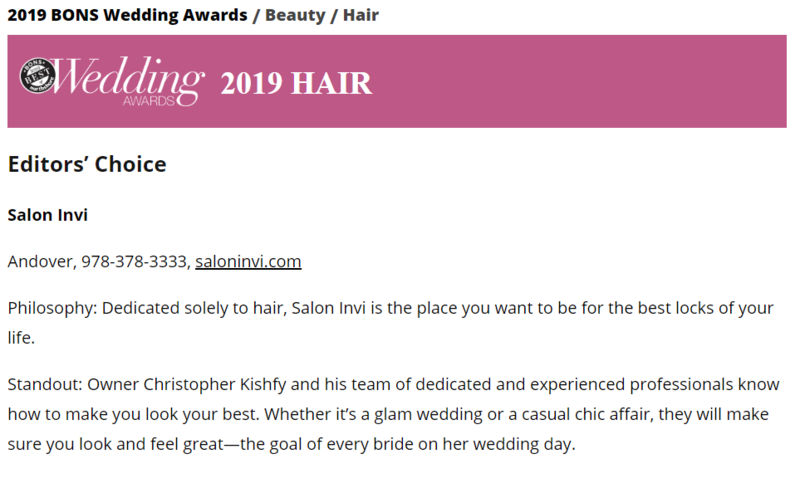 Salon Invi is proud to receive the 2019 Editor’s Choice Award for Wedding Hair for the 10th year in a row. The salon’s unique approach to personal style and exclusive focus on hair has truly persevered in the Boston area’s saturated market. Owner Christopher Kishfy boasts more than 20 years of experience in the field, he owns, manages, and educates stylists at numerous salons across the area. Thanks to his years of education, talent, and dedication – as well as that of his entire team – Salon Invi continues to stand out as one of the very best salons in Boston and the surrounding area.